Welcome! I am Sandra Litva Moran; a Croatian-Canadian, moved to the U.S. in 2006. With careers rooted in art & expressing my creativity, from Ballerina to Hairstylist; my constant has been jewelry. LITVA'S is about women who are effortlessly chic, who radiate confidence in their uniqueness & celebrate it. Eclectic timeless pieces designed to be worn layered or alone, with color & variety as the essence. * Orders ship insured with signature confirmation via USPS Priority Mail from Springfield, MO to addresses throughout the U.S.A.
*A specified Care Tips card is included for each Copper, Sterling Silver, Silk and Peyote Stitch item in your order; which you will pass along to your customer at checkout, ensuring they take the proper care of their handmade pieces. *Defective product may be returned at my expense within 5 days of delivery. *To be/remain a LITVA'S Jewelry re-seller you must sell direct to your consumer. For all online sales; websites must be owned & operated by your company. 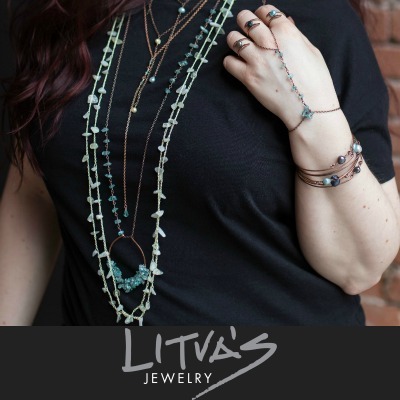 Selling LITVA'S Jewelry in the following ways is prohibited: selling on third-party sites, drop-shipping sites, classified sites, as well as selling in bulk to B2B accounts or other wholesalers. *All jewelry is shipped with my branded packaging; if your displays do not accommodate these (or you prefer not to promote individual artists) please send me a message when you checkout to prevent unnecessary waste. Please feel free to contact me if you have any questions at all! I look forward to getting to know you, your customers & cultivating a wonderful partnership!